*Click on any images for a larger view. *Parenthetical times (4:25) denote a corresponding time in the accompanying video. The officer came to the window and told me I was going over the posted speed limit. I told him I had my cruise set "right about" the speed limit, which was technically true and then asked him to confirm that the limit was indeed 70mph. He then asked me a ton of questions about where I was from, what I was doing, where I was going, etc. 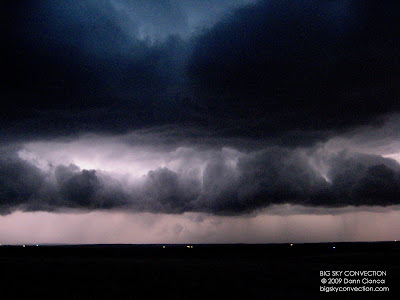 I explained that I was heading down to Shamrock, Texas to study and document severe weather. He even asked me where I got my meteorology degree from. In the end, I was issued a warning and thanked him. Jason looked through the GPS log and found that I was going closer to 75mph, so my speedometer must be off. We continued to Amarillo where we got lunch and then headed east on I-40. 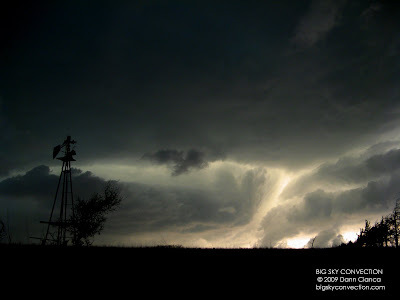 There were a few puffs of cumulus along the dryline which bisected the interstate near Boydston. We stopped in Jericho to have a look at things (2:48) and just hung out for a while. 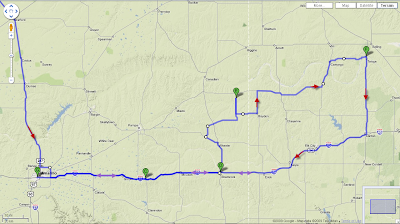 Nothing too spectacular was going on, so we continued east toward my initial target of Shamrock, Texas. In Shamrock, I ran into Colorado storm chasers Sean Mullins and Jon Merage and we hung out for a bit in the Dairy Queen parking lot. Things suddenly started looking better to the northwest, so we got on the road, heading north toward Wheeler, Texas on US 83. I realized that I forgot to fuel up in Shamrock and though I wasn't running low, I thought it a good idea to fill up in Wheeler to set us up for later just in case. The storm was still getting going at this point, so we figured we okay. 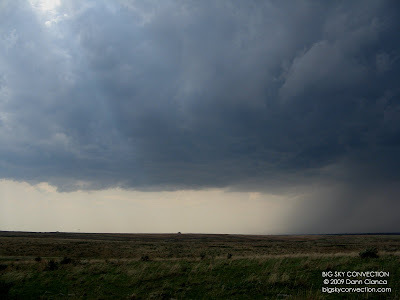 We headed west out of Wheeler to Ranch Road 3182 and had a nice vista of the storm. 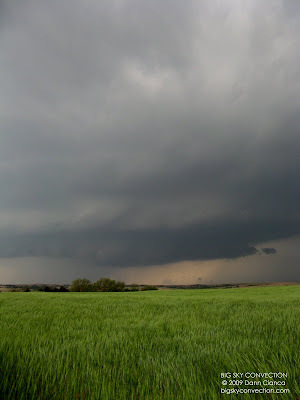 The base was very high but held a broad, slow rotation. 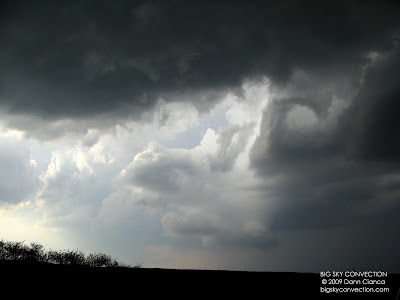 There was a bit of scud being pulled in (3:20) and I also witnessed a few gustnadoes in the inflow. We got back going after a while and I also witnessed a pretty strong gustnado (3:24) right as we turned onto Ranch Road 1046 and started heading back to the east. We followed the storm as it tried to organize (3:36) to Allison and it really wasn't doing much, so I decided sampling the core might be a good idea. We continued north on RR2654 and started getting into the rear-flank core. 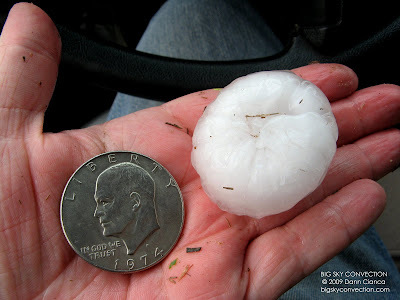 It began to hail quarters and then it started getting larger. I thought I turned on my video camera, but somehow I did not, so missed the best part of the show. 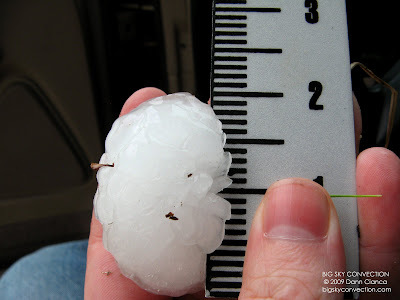 I turned into the hail as to not blow out the side windows as the stones were obviously larger than golf balls. I don't know what the official definition of "gorilla" hail is, but in my inexperienced opinion, I would call this gorilla hail! I first noticed a radial crack in the wind shield which subsequently spidered and was joined by a new one at the base of the wind shield. I wasn't even slightly upset about this ... I had been wanting to baptize my rig for a while now! I eventually realized I wasn't videoing and started to record (4:00), but most of the big stones had already fallen. When they stopped (for the most part), I got out and grabbed some of the bigger ones. Most of the large stones were around 2" and maybe a few were a bit larger, but none moreso than 2.25". The stone I measured was only 2" but it had melted a bit. At this point, I had already deemed the trip worth it and anything else that would happen would be a bonus. 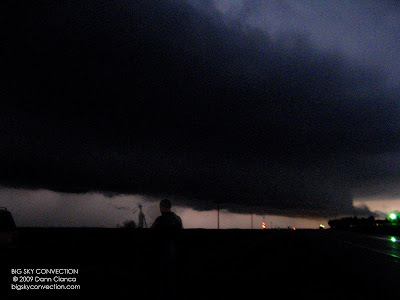 We headed back south toward Allison as we didn't want to get back into the core and completely destroy my wind shield. 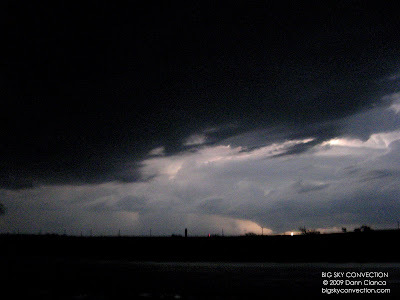 We continued into Oklahoma and watched as the storm began to organize. 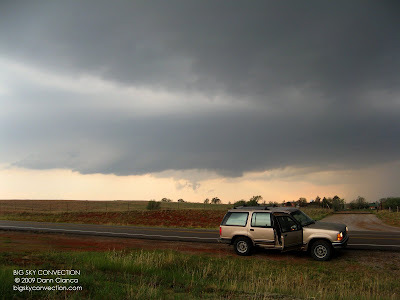 We intercepted a wall cloud between Durham and Reydon, Oklahoma and it came pretty close to producing. (5:15, 5:35) Then, we followed the storm east again, dealing with the obstacle known as the Canadian River. We briefly ran into Tony Laubach here who was nice enough to serenade me with "Happy Birthday" before the Discovery crew had to continue on. We left after a bit and crossed the Canadian, right before the core. I continued east on paved, but curvy road along the north side of the river. 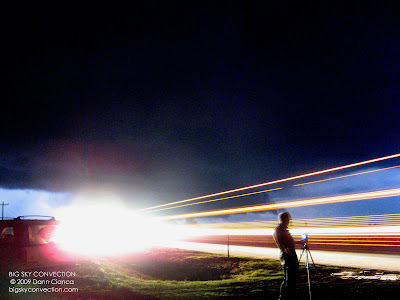 I had a blast driving on the windy, wet road with the core of the storm nipping at our heels. THAT was fun. (Though I'm not sure how much Jason enjoyed it!) It reminded me of being younger in Montana and driving up the road to my grandparents' house in the mountains ... as fast as I could. 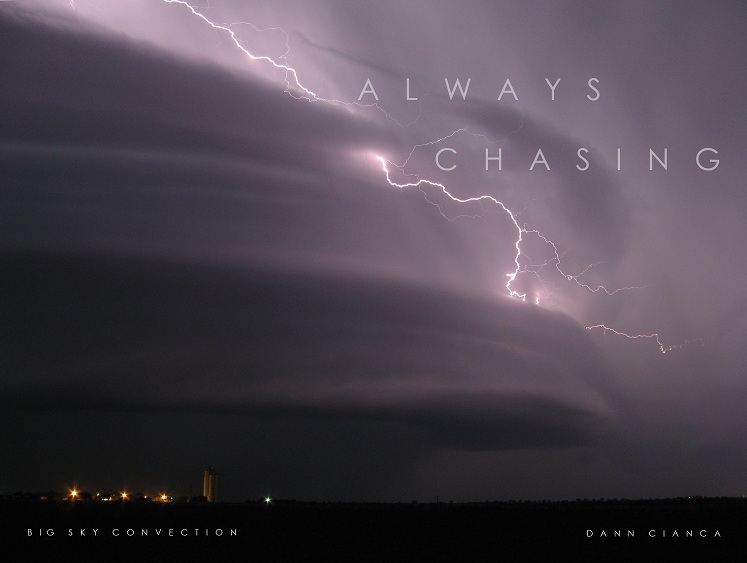 I'd be lying if I said half of the fun I get from chasing wasn't actually driving. Anyway, it started getting dark, but the golden color of the small amount of light peeking through was stunningly gorgeous. 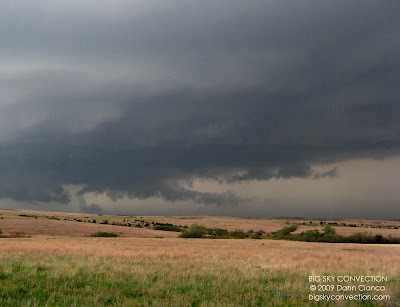 We stopped on a hilltop to take some pics/video (8:25) and ajusted a bit (8:28) for a better shot as the storm moved over. The mesocylone was beautiful in the light ... it was absolutely divine. We gave up on the storm at this point and headed south toward I-40. Verne Carlson was allowing us to stay in Amarillo for the night and we wanted to get back. 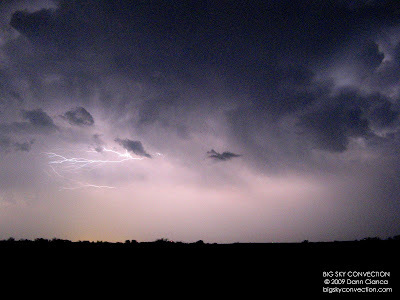 We did stop a bit to shoot some lightning, but much to my dismay, most of my shots were taken with ISO 800 ... oops. We hit I-40 and stopped in Elk City for some dinner where we encountered (randomly) Colorado chasers Ryan Shepard, Johnathan Skinner, and Chris & Krista Yates. Eventually, we rolled into Amarillo at 2:00AM CDT and we were off to sleep, preparing for our "consolation day" on Sunday. I'm not sure if you are helping us tundra dwellers up here with our SDS or making it worse with these fantastic photos. That first one from Dewey + Putnam gave me a little adrenaline shot. Lucky bugger. Nice birthday treat!